Home » Connectivity » A million sign ups in two months: How is EcoSure growing so fast? A million sign ups in two months: How is EcoSure growing so fast? What do we remember about telecoms services last year? Well, for one thing Econet Wireless went all out with new products. The mobile network operator seemed to extend its hand to everything from money remittances to cars and water. What ended the year though was the launch of EcoSure, the mobile insurance product that took the place of a similar but failed product Ecolife. Two months later, we’ve been told by Econet that EcoSure has registered over 1 million users, an uptake that translates to 150,000 new users every week. It’s a faster uptake than what Ecolife was registering in its first half year back in 2011(1.6 million in 7 months). These are impressive numbers, so what’s the secret behind this? It’s a no-brainer. Micro-insurance products that ride on the extensive reach of mobile telecoms are an awesome idea. EcoSure is solving a real problem, addressing a huge market and they have figured out dynamics like pricing. These are the same merits that are shared by Telecare, the competing product from Telecel. However, I don’t think that EcoSure’s steam and this impressive rate of sign-ups is entirely from the strengths of the product. 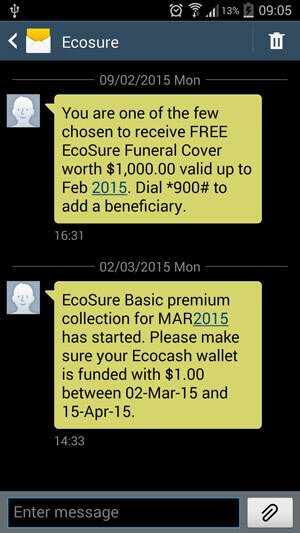 I was involuntarily “signed up” for the service and had to find out from the mobile network why I had received a notification telling me that I had to keep my EcoCash wallet funded with $1 every month for the EcoSure auto-debit facility to work. Why should something that has an auto-debit facility be automatically pushed onto subscribers anyway? With more mobile insurance products lined up through this EcoSure model, I wonder how many new insurance services I’m going to be opted into. You can read the statement from Econet regarding their million user milestone below. Econet has once again scored a new blockbuster service to follow in the footsteps of EcoCash. In just two months, the company’s insurance service, EcoSure, has registered over one million new customers. EcoSure has been registering more than 150 000 new customers per week as it emerges as Zimbabwe’s largest micro-insurance provider by customers. Econet Wireless CEO Douglas Mboweni acknowledged the phenomenal acceptance of the new service, saying it offers the possibility that Zimbabwe could achieve universal insurance coverage before the end of the year. “We have a situation where families do not have to deal with the shock of unplanned funeral costs after the loss of a loved one,” he said. Mr Mboweni said although the packages available ranged from those with premiums of 50c per month for a pay-out of $500 to $5 per month for a pay-out of $5 000, the most popular package is the $1 per month, which has a pay-out of $1 000. The Econet boss also revealed that in keeping with the “Econet tradition” of rolling out many innovations around a new service, plans are well advanced to launch other insurance products. “We have a massive pipeline of new insurance products to satisfy every need that you can imagine. Some of these products have never been seen anywhere in the world before. We don’t want to spoil the surprise by talking about them prematurely,” he said. I got the same message. It too me some time to figure out. I am not sure I am interested in this on top of the other numerous life assurances that one has via other channels. I also got the message and had to opt out. I wonder how many others don’t even know. Is this even allowed – coz surely I should choose how to spend my money. Plus I think there might be breach of privacy where everyone registered with Ecocash is automatically added to the package. I also experienced the same and a dollar has been deducted from my e-wallet without my concert today and that is robbing your customers Mr Steve . I think econet should be honourable and professional enough to seek its consumers’ concert to these deductions otherwise this is day light robbery and I think the nation needs to discuss such acts on forums such as Amai Chisamba show. Its not fair to force people to subscribe to a service they do not want. Be professional guys, personally I will fight back until I have been re-embursed that dollar of mine. I challenge the writters at TechZim to dig further and follow this up. there is a bigger ethical question here. I just saw a message from EcoSure stating they have deducted a dollar from my EcoCash account. This is problematic on so many levels. How safe are my funds with EcoCash when they are now making decisions on how I should spend my money. Can StanChart also start an insuarance scheme and deduct cash from my account. This is illegal and unethical. Authorities need to look into this anti competitve behavior, which comes into play when one is in too many sectors of the economy. they sharing my data across subsidiaries, they get free marketing and now they are transfering my funds… RUBBISH, serius disregard. I think its better to pull out all my funds from ecocash and use bank halls as usual because our monies won’t be safe . I was thinking that ecocash is convenient and better off than bank halls but if I compare I have discovered that my money is much safer in bank halls than ecocash and besides bank halls charges are even cheaper. Please investigate this I also got a similar message. Econet must return our money immediately and be fined on-top of it! How the hell do you opt out of this? I also saw the message requesting me keep a $1 in my wallet. but I didn’t bother to see what it really meant. there are too many unsolicited messages from econet that I don’t usually read them but just delete without bothering to read. tired of unsolicited econet messages , you might say a million subscribers have signed onto this but i doubt it , i say this coz i was automatically added onto ecosure, i didnt sign onto this . its high time our useless gvt stops econet in its tracks is that legal anyway ?econet shld simply staroff an insurance company not take adv of their customers . Potraz must do something. I feel pity for those our elderly and the illiterate Econet subscribers. The next thing they will not be able to buy a lot of bread/pay kombi fare with their last dollar in Ecocash. So a team sat over it, and saw it right to auto-register and auto deduct funds from and apparently secure mobile wallet? Only in Zimbabwe is money made this easy I guess. Who even knows of the terms and conditions? What is EcoSure? What is a premium? What is a cover? Where do I claim? After how long? Is there cash back? Surely business can be done in a better way than this pilferage in our wallets. Econet is robbing its subscribers. they automatically deducted $1 from every epochs subscriber towards the ecosure thing which am sure not even a single person subscribed. Will definitely sue them coz its unethical and unheard of especially with ecoThieves being a large corporate as it is. You tend to wonder if there is any form of corporate governance in Zimbabwe’s companies. hold your wallets, Econet is coming to the party.